1	1	Mixed Pen Value Pack	In Stock - Order before 4pm for same day dispatchWant it on Wednesday 24 April? Looking for faith-friendly prizes or resources? 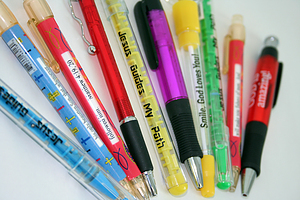 Pack of 10 Pens with Christian messages or verses. Perfect for Sunday School prizes, Youth Groups and Kidz Clubs. Not all pens included in the image may be contained in the pack. Mixed Pen Value Pack is published by Eden.co.uk and is our 1088th best seller. The ISBN for Mixed Pen Value Pack is EDENSSPENS1. Lovely looking pens. The kids were thrilled when I gave them out. But sadly the ink was dry in a lot of them or dried up quite quickly. I wasn't going to say anything about them but when asked to review I thought I should tell you that we were very disappointed. Might just be a faulty batch!! Got a question? No problem! Just click here to ask us about Mixed Pen Value Pack.